2014 Summer News | Able Canopies on Our best year ever! Some of our installation projects involve the co-ordination of numerous construction phases and trades. We have the capability to deliver professional project management to ensure the complete canopy installation is delivered on time and on budget. Each of our installations involves project management. Coordinating start times, deliveries and hand over, all take planning and communication. These skills allow us to look the requirements of each project and sometimes widen our responsibilities to include more elements of the installation and the management of more trades. This example shown here highlights projects where we have done that. The school had an existing canopy which was no longer fit for purpose. They wanted this removed and replaced with not just a canopy but with a new soft play area underneath the shelter plus secure roller shutters to ensure that any school equipment could be kept safe. The shutters would also help to keep the soft play surface in better condition in bad weather. The project therefore involved four distinct phases and different work requirements. Firstly, the removal of the existing canopy, then the marking out and kerbing of the new soft play area and laying of that new surface, then the installation of the new canopy and finally the addition of the roller shutters. The school wanted one company to manage the project and deliver the overall transformation of the space. This would mean more efficient use of their time and ensure a co-ordinated approach to project completion. 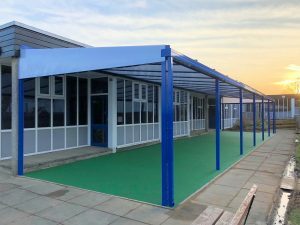 To ensure that the school got the weather protection that they required, within their budget, our recommendation was to install a Coniston canopy. This popular and flexible canopy would give the projection required and enough space between posts to ensure as much free movement as possible, but also the support required for the roller shutters. We undertook full project management responsibility for the project. We have installed soft play areas before and the skills within our team allowed this to be carried out efficiently. We co-ordinated with suppliers and then with other trades for the installation of the roller shutters and lighting. Because the canopy was the main part of the programme we could schedule the works efficiently. By taking on overall project management we had to deliver clear and regular communication with the school and other trades. Our experience and construction knowledge were used to ensure high standards of quality and safety were met and scheduling was adhered to. Project management on this scale is not something that we undertake on every project. Often it is not required as there will already be a main contractor on site, but where we can add value for the customer then we will use the skills of our team in other areas. The pictures show the finished installation. 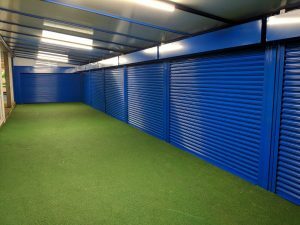 As required, the area can be enclosed with automatic roller shutters which allows equipment to be kept safely and the soft play area protected. The video shows the shutters in action. We also added lights to ensure the space can be used safely all year round. This project has given the school a brilliant new space that can be used for outdoor learning, activities and all-round fun. Effective, professional project management ensured a hassle free installation that met the needs of the school perfectly. Free Flow Outdoor Play and Outdoor Learning. Kelvin is the Marketing Manager here at Able Canopies and is passionate about how our customers can make the most of their outside space. He is also interested in new technologies and how they can be applied to assist project design and energy saving. This entry was posted in Case Studies and tagged Coniston, Project Management, Roller Shutter, Roller Shutters, Secure Roller Shutters, Soft Play, Wall Mounted Canopy by Kelvin Bathe. Bookmark the permalink.